MCCS follows the Central Board of Secondary Education (CBSE) syllabus from KG to Class XII with personal inputs and activity oriented education so that the pupils learn with flexibility and active involvement in the learning process. English is used as the main medium of instruction. National and regional languages are also given due importance. Class I – X: The school follows CCE – Continuous and Comprehensive Evaluation introduced by CBSE from Class I to X, a system of evaluation which covers all aspects of students development. It includes assessment in scholastic as well as co-scholastic aspects of the pupil’s growth. Scholastic Assessment consists of Formative and Summative Assessments which include unit tests, assignments, projects, quizzes, oral questions and conversational skills, neatness and systematic completion of work and written exams. This assessment will be informal most of the time, but it will be an ongoing process and students have to spend time daily on personal study. Co-scholastic Assessments include Literary and Creative skills, Aesthetic skills and performing art and clubs, Co-curricular activities, social skills, emotional skills, values, attitude towards teachers, classmates, peers, school programmes, environment etc. Classes I to V follow trimester system and will have Evaluation 1, 2 and 3 at the end of each term – September, December and March. Classes VI to X follow semester system and will have 4 formative assessments and 2 summative assessments – September and March. Class XI and XII have annual exam system with 4 unit tests and a mid-term exam in September. Promotion is based on the total performance at these tests and exams and regular attendance. It is the policy of the School not to fail a student as far as possible. At the same time, a student who has not acquired the necessary skills to study in a higher class may be not promoted. MCCS is interested in providing additional possible facilities for slow or weak learners to acquire the necessary skills if parents co-operate with the School in this regard. However, the School strongly discourages the practice of excessive home work, rote-learning, special tuitions etc. ‘Kindergarten’ in the German Language means ‘Children’s Garden’. In this beautiful garden lovely flowers bloom and blossom spreading around the sweet fragrance of their presence, innocence, childlikeness and love. During the two years when they bloom into beautiful flowers, the staff tirelessly attends to their intellectual, emotional, spiritual, physical and aesthetic growth through the choice of subjects taken up with them. The morning Assembly opens the day to God in fervent prayer and song followed by Rhymes and Jingles and Action Songs in various languages. These warm them up for the rest of the day. The morning session introduces them to the world of Numbers, the English Alphabet and simple Keep-fit exercises-all made easy to grasp and remember through action songs and interesting stories. The Nature Walk and Environmental Studies introduces them to nature and to the beauty around with an awareness to protect and guard it against any hurt or damage to God’s gift to them. We also want to make them know the beauty of creation and of God’s love for them in providing such a lovely place to inhabit. They have a snack break at 10:00 a.m. for 10 minutes only, when they enjoy the biscuits and water which the children bring from home when they come in the morning. This is the time when they are initiated into good habits of eating, cleanliness, independence, orderliness and discipline, intermingling with others and socializing with their companions. The LKG remains in the Institution during the morning session which is from 8:30 a.m. to 12:00 noon. After the lunch break from 12:15 p.m. to 12:45 p.m., the UKG, children take a ‘nap’ of half an hour’s duration. From 1:15 p.m. to 3:15 p.m. they are involved in activities improving on their sense of colours, shapes and dexterity of fingers at art of various kinds. They have Drawing, colouring, clay modelling, Copy Writing and Story-telling, Dance and Karate. Children burst into roars of laughter while watching Cartoon Video pictures which are regularly screened for them. They listen to audio-video cassettes which keep their feet tapping in rhythmic steps. P.T. is taught to relax, to increase their power of concentration and to improve their muscular fitness and flexibility. Craft like Paper folding, Finger printing, Vegetable Painting and Paper sticking are taught in the afternoon. Classrooms are equipped with Smart Class System and good educative C.Ds connected to the lesson are shown to the children during the class. At the KG level we do a lot of Oral Work and involve children in activities of various kinds that will help in their growth-but have less of written work. Through these exercises and activities we desire to achieve the Aims and Objectives of our Institution and make attendance in class a joyful experience. Talent Week is held to discover and develop their talents and skills before the Children’s Day Celebration. Singing, Drawing, Fancy Dress and Dance. Parents and Guardians are reminded that without their help and co-operation, not much fruit can be expected in the normal intellectual and cultural development of the child. They are therefore requested to enforce regularity and discipline in their Child’s work and supervise their daily homework. 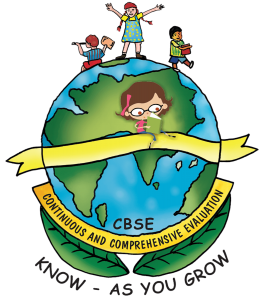 The school follows CCE-Continuous and Comprehensive Evaluation from class I to X introduced by the CBSE, a system of evaluation which covers all aspects of students development. It includes assessments in Scholastic as well as co-scholastic aspects of the pupil’s growth. Scholastic assessment consists of Formative and Summative Assessment which includes the unit tests, assignment, projects, quiz, oral questions and conversational skill, neatness and systematic completion of work and written exams. Ths assessment will be informal most of the time, but it will be an ongoing process and the students hve to spend time daily on the personal study. Co-scholastic Assessments include Literray and Cretive skills, Aesthetic skills and performing Arts and Clubs, co-curricular activities, social skills, emotional skills, values, attitude towards teachers, classmates, peers, school programmes, environment etc. Classes I to X follow semester system and will have four formative assessments and two summative assessments – September and March. Class XI and XII have annual exam system with four unit tests and a mid-term exam in September. Promotion is based on the total performance in these tests and exams and regular attendance. It is the policy of the school not to fail a student as far as possible. At the same time, a student who has not acquired the necessary skills to study in a higher class may not be promoted.